Ultra Lightweight & Ultra Portable: The Captain Stubling rig offers a new level of portability and light weight for still and cinema-style shooting rigs. Carbon Fiber Rods: All DSLR bundles ship with carbon fiber rods. Redrock's unique process results in precision, incredibly strong rods that are 66% lighter than comparable stainless steel rods. Future-proof Accessories: This rig is based on cinema standards wherever possible, including the important specs such as 15mm rails, film pitch gearing and standard filter sizes. microFollowFocus v2: Completely gear-driven design for slip-free, accurate and repeatable focus movement. microFollowFocus v2: Unique quick release clamp. microFollowFocus v2: 1:1 gear ratio allows smooth movements for still and motion picture 35mm lenses. microFollowFocus v2: Adjustable slide-mounting mechanism to fit large range of lens diameters, including video camera lenses. microFollowFocus v2: Interchangeable drive gears including 0.8 film pitch and Fujinon pitch (for Fujinon video lenses). microFollowFocus v2: Easily switchable to either side of camera. microFollowFocus v2: Optional microLensGears can be quickly attached to existing 35mm still (SLR) lenses for accurate gearing. microFollowFocus v2: 3D marking disk allows focus marks to be easily viewed by operator or assistant. microFollowFocus v2: Standard Arri-style accessory port in focus wheel for attaching whip, speed crank, etc. microFollowFocus v2: Industry-standard 15mm lightweight (60mm spacing) rod mount (rod support not included with microFollowFocus bundle). microFollowFocus v2: Optional 19mm rod clamp adapts microFollowFocus for 19mm rods for cameras, including the Red ONE. microFollowFocus v2: Optional Fujinon 0.6 pitch drive gear works directly with Fujinon lenses. microFollowFocus v2: Optional reversing gear focuses Nikon and Pentax lenses in the "correct" cinema direction. microFollowFocus v2: Constructed of high quality, machined aircraft-grade aluminum. microFollowFocus v2: Lightweight design. microFollowFocus v2: Sleek Redrock look. microFollowFocus v2: Works great with DV and HDV built-in camera lenses. 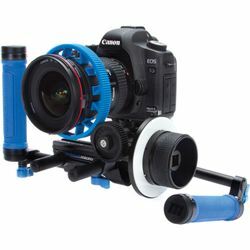 DSLR Baseplate: This unit's quick-release, rod-locking system is designed to offer fast attachment and removal. DSLR Baseplate: It includes a locking pin for Nikon and Canon cameras to prevent rotation. DSLR Baseplate: It features a rubber-padded platform. DSLR Baseplate: Professional-grade machined aluminum construction ensures its durability.